After all these years, I have finally discovered a way to write short blog posts: buy a satellite phone, head out into the ocean and send a position report with a limited amount of characters for the cheap rate of 50 cents! Of course, after a few days, writing withdrawal happens and the desire to turn my computer on – which, by the way, broke today typing this blog; it must be too long again - and touching those cute keys of my keyboard becomes imminent. Mark and I left Las Perlas and Panama for the Galapagos Islands last Saturday. We were ready, but had to wait a bit for the breeze to fill in. This 900-ish mile journey is seen as a difficult one. Not so much from a safety or stormy perspective, but from another weather occurrence. The winds are generally (too) light, change direction at some point, become variable and disappear completely in the ITCZ ("doldrums") area. So, you better have some wind to start with. In our case, the second and third days were predicted to become VERY windy – not Mark's idea of an ideal first long distance sail. It was a reason we wanted to begin the journey a day "ahead", to try and avoid the worst of the system. Day 1 had us fly the spinnaker, doing a speed of about five - six knots. A few other sailboats left with us and soon disappeared behind the horizon. We had VHF radio contact with two of them during the day. Irie, with her 35 feet overall length, is small compared to other cruising boats around. She is not labeled or "certified" as an ocean going vessel. 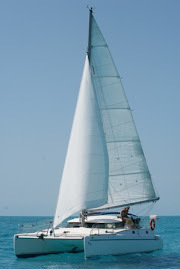 We trust her, however, and she is a great and safe little catamaran that has not disappointed us yet. We just have to be a little more careful and take into consideration her smaller size and lighter design. What this means on the Pacific Ocean is that we should reef conservatively and not surf down waves at 13 knots! She does stand her ground, though, and is sailing majestically. The first evening, we concluded just having the mainsail up would give us the best downwind progress. Unpredicted, the wind piped up to 35+ knots at night and when we were surfing at over 12 knots (with a new Irie record of 13.6 knots), we decided it was time to put two reefs in the main. For the rest of the night, with only a double reefed main up, we were sailing at well over 7 knots. Day 2 had a decent amount of wind as well, and we changed our course so we could use our main and jib. By the following evening, we had learned our lesson and started the night shifts with a double reefed main, no jib, to make more southward progress (downwind). When a similar scenario of the previous night occurred, with winds topping 35 knots and waves bigger than Irie, we had yet to make another adjustment in the middle of the night, centering the main sail to reduce speed. All it would take is surfing down one massive wave and having our bows dig into the water first, to have our house flipped over. Did I mention we have a small and light boat? Which is a tad heavier than usual with all the extra provisions? The first days and nights, we were constantly slowing Irie down, making the gap between us and our larger, heavier peers bigger. On day 3, another downwind haul, we started with a full main up. The wind blew a steady 30-35 knots and we were moving along nicely, at 9 knots. (I have to admit, we have been having 1-3 knots of current with us.) Frequently, we would surf down the waves and saw our speed over ground top 12 knots. "Fun and invigorating" says Liesbet. "Scary! I'm not liking this!" says Mark. And reefs appear in the sail again. For this, we unfurl the jib a little bit, head into the wind and gigantic – wet – waves, drop the main a bit, put the two reefs in and haul her up again, considerably reduced in size. It made the ride more safe and comfortable, and we were still doing 7-8 knots. It was great, even though we couldn't really do much more than sail on the bumpy ocean. Last night, the wind dropped big time. But, you never know; the previous nights it blew pretty hard from the moment the sun went down… So, we started off with a double reefed main, in 15 knots of wind, and made slow progress. Maybe it would be a quiet and comfortable night, once the waves settled down? Or maybe the wind would pick up just enough? Kind of a waste to go so slow… In between our shifts, we went to the trice daily procedure again and took the reefs out. For the next four hours, the sails and boom slapped and banged around, while the wind speed reduced to less than 10 knots. Not wanting to deal with all the work involved putting the spinnaker up at night, we resigned to … motoring for four hours. Darn! First thing this morning, we "installed" our saving grace, the spinnaker, which is a light wind sail. With it blowing barely seven knots (apparent wind less than 2 knots), it is the only sail we have that will get us moving, albeit relatively slowly. Thanks again, Axel!  The seas have settled down and today's ride has been very smooth indeed! We finally got to do some "different" things than usually. Distance-wise we are over half way to the Galapagos at this point, but time will tell how much progress we can keep making in the light winds. We will fly our colorful sail tonight as well. At least we'll try. During the day we keep ourselves busy with sailing the boat, staring at the horizon – without getting seasick! – figuring out routing and weather (Mark spent days on end doing this before we left and still spends many hours a day figuring everything out. He's doing a great job interpreting and incorporating the grib files, but the forecasts are never right, unfortunately. The wind directions seem to be pretty accurate, but the speeds are way over or underestimated. ), and resting. We have yummy sandwiches for lunch around noon, after I do a "manual" log and plot our course on a paper chart of the Pacific Ocean, which is… big! The ocean is. At 17:00 the evening procedures start. Not with cocktail time, but with reeling in the fishing line and figuring out a (new) course and sail trim. We do this before the sun sets, to avoid the cold, windy, pitch black and slippery decks at night. Haha! Then, we have one of our six pre-prepared and tasty dinners and do the dishes. Mark installed a salt water pump and spigot in the sink recently. One of the best additions to an always improving Irie! We have interesting conversations, like "What time did the sun set?" "18:34" "What time is it this evening? She's going down right now!" "18:39" We write another log on the computer and at 19:00 Mark grabs the new weather forecast and grib files and takes all the new information into account. More than likely – by then it is dark – we adjust the sail(s) again, and another time at some point during the night. Around 20:00, we start our three hour night shifts: Mark until 23:00, then me until 2:00, Mark again until 5:00 and me again until 8:00. Whoever is off shift, tries to sleep in our bed downstairs. What do we do during our night shifts? Mark is all alone with his tablet. He listens to music and watches something on the screen. I am all alone with my thoughts. I listen to the sounds of the boat – whooshing of the waves, wind generator, creaks and bangs – and watch the twinkling phosphorescents in our wake and the bright stars in the sky. We keep an eye on the instruments and the sails and every fifteen minutes we check the horizon. It is inevitable that we "knikkebol" (doze off) more than once in a while. We haven't seen any wildlife worth mentioning yet, except a helicopter checking us out. We also haven't caught any fish yet. Mark did put a second fishing line out today, but I expect them to catch each other, before they catch something edible! The previous days have been chilly during the day and cold at night. We dug out long pants, sweaters, socks, hats and the comforter to sleep under. The heavy winds and cool air has not been very conducive to taking showers. Luckily, there is no one around, for hundreds of miles… Today, the sun came out, the wind disappeared and the sky was a beautiful blue. The highlight of the day was a fresh water sun shower in the cockpit and … a change of underwear. And so, there is some special event every day on the water. One day soon, it will be crossing the equator – which will have to be celebrated in Irie fashion – another day, we will catch a fish!